Call 800-298-8924 to order Superwinch accessories and parts part number SW1551 or order online at etrailer.com. Free expert support on all Superwinch products. Guaranteed Lowest Price and Fastest Shipping for Superwinch Quick Connects, 6-10 AWG Wire. Accessories and Parts reviews from real customers. Makes removing and replacing the winch easy! Today we're going to be taking a look at part number SW1551. These are the Super Winch Quick Connects. It's going to make removing and replacing your winch really easy. You don't have to disconnect all the wires and rerun them next time you need the winch. This offers quick connect and disconnect. That way you can quickly and easily connect and disconnect the switch or wiring harness to your winch. These two units right here act as a plug. Once you have everything installed with the contacts and the wires, that way you can quickly and easily connect and disconnect your system. The housing is made from a polycarbonate material, very strong and durable, and corrosion resistant. It's going to come with the quick connect plugs and four contacts. These contacts are going to fit six to ten gauge wires. Here on the housing it's going to feature mounting slots, that way you can attach these to your application. All you have to do is strip your cable to fit into the contact, into this portion here, and then you will need to crimp and solder the contact to the cable. This portion right here has a nice little hook on it, fits through the end here. Please note that each side is labeled positive and negative, so you want to make sure that you're running your wires to the correct locations, but it has a nice little hook on it that way once you install it in here, it's going to catch onto a stainless steel spring. That's what's going to hold the contact into the plug. Then you just simply repeat that process for all other connections. Once you have all the wires connected you'd simply connect the two plugs together, and your connection's going to be made and now you can have everything installed when it comes to the wires. Again this system just allows easy installation and quick disconnect and connect when it comes to the switch or the wiring harness. That's going to do it for our review of part number SW1551. These are the Super Winch Quick Connects. . Very Well. Are you marketing the connector with additional Contacts? You have a couple of options for a battery disconnect I recommend. You can use Superwinch Quick Connect # SW2236 or # SW1551 depending on wire gauge to give you quick connect/disconnect. If you prefer a keyed disconnection switch you can use the Epicord Battery Disconnect Switch with Key - 50 Amp # 277-000096. This will isolate your battery to prevent power drain with the turn of a key. There are some quick connect options for winches. We have # SW2236 for 2 to 4 gauge wire, # SW1551 for 6 to 10 gauge wire. We also have # DL24085 for 6 to 16 gauge wire and # DL24086 that accepts up to 10 gauge wire. I have included a link to our FAQ article on wiring an electric winch that should be helpful. The Superwinch Quick Connects # SW2236 that you referenced will work with winches that have wiring in the 2-4 gauge range. The weight capacity of your winch is a function of both motor capacity/wiring gauge, and also its gear train. 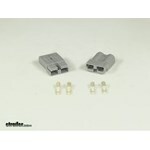 If your winch uses wiring in the 2 - 4 AWG range then you can use this connector # SW2236. We also offer part # SW1551 that fits wires from 6 - 10 AWG. The recommended wire kit for Superwinch winch # 1220210 is # SW1520. This kit includes the wiring and the quick disconnects. If you wanted just the quick disconnects you would need # SW1551. These are the same ones included with the previously mentioned wiring kit. I have linked installation instructions for you and a link to our help article on wiring an electric winch. The Superwinch Winch 2 Go 4000 1140222 comes with 6 AWG. Therefore the correct quick-disconnect terminal would be part # SW1551 which is rated for 6-10 AWG, not part # SW2236 which is rated for 2-4 AWG. In order to use the quick-disconnect terminal rated for 2-4 AWG, you would also need to change out the wires in the box that run from the ring terminals on the winch to the quick-disconnect terminal on the back of the box. The quick disconnect part # SW1551 that you referenced is the same connector that is included with the Superwinch Winch 2 Go 4000 SR # SW1140232. What you could do is use quick connects such as # SW1551. One of them you would wire to the batteries using 10 gauge wire such as # 10-2-1, sold by the foot, and the other one would wire to the solar panels. 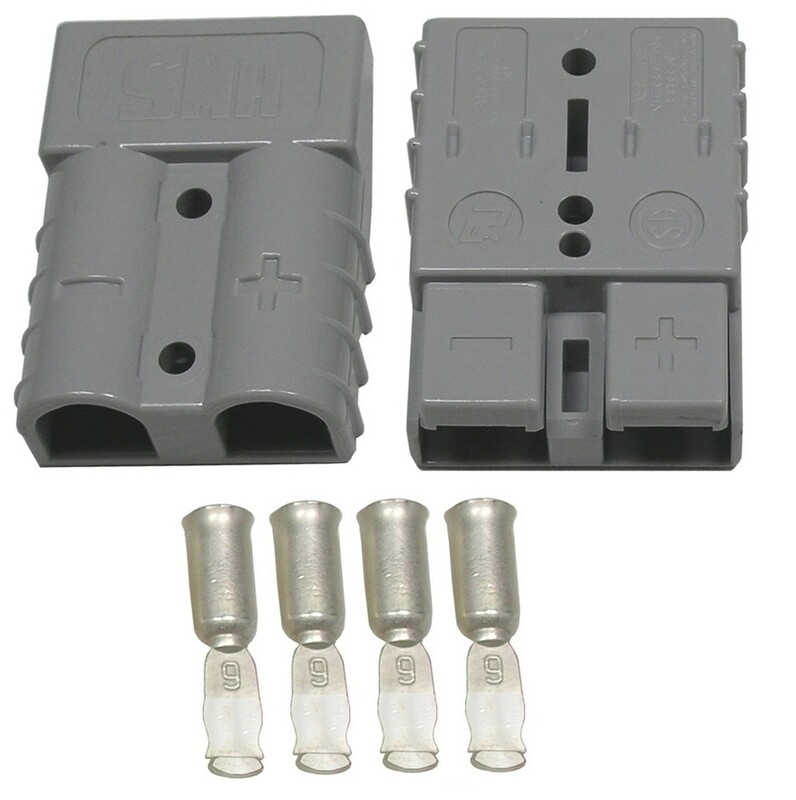 These connectors can accept wire as small as 10 gauge so anything smaller than that you would have to double up the wire before securing it in the terminals. The Superwinch quick connectors # SW1551 themselves do not have any sort of cover to protect them from the elements. But what you could do is modify mounting box # RP74641 and that will help protect them. There is no one place that you have to mount the connectors. You can mount them in a place that works best for you. We do sell 10 gauge wire. I recommend # 10-2-1 since it is 2 wires in 1 sheath. It is sold by the foot so if you needed 20 feet you would put 20 in the quantity box. Quick connects like the Dutton-Lainson Electrical Quick Connects # DL24086 that you referenced do not have a release latch built into them. Basically you just slide them apart. They can sometimes be difficult to get apart, but if you wiggle them while pulling on them they will release.